Beginning in 1967, On The Road With Charles Kuralt began its 25 year run. The show elevated Kuralt into a beloved national icon and won a slew of awards along the way. The premise of the show was deceptively simple. Kuralt and his crew traveled the United States in a motor home, in search of interesting and offbeat tales. Over the course of its run, the show hit all 50 states and managed to go through six motor homes. The various episodes were originally compiled for broadcast on The Travel Channel. Later, they were released by Acorn Media as individual three-disc sets. The new, definitive On The Road - The Americana Collection has gathered all of this material into a nine-DVD set, which features 50 episodes, and runs an impressive 17.5 hours. One of the most appealing aspects of On The Road was its celebration of a vanishing America. Since Kuralt’s passing in 1997, nobody has stepped up to fill his shoes, and it is unlikely anyone ever will. Knowing this, the thrree to five minute vignettes become ever more poignant as time marches on, revealing themselves to be the work of a one of a kind television journalist. When I was growing up, we watched this show regularly, and I fondly remember many of them. There is the great story of a small town library in Oregon that stays open 24 hours a day, 365 days a year. Another classic features a man who actively solicits for junk mail to burn in his wood stove as a source of heat. I recall marveling at learning that the Zildjian cymbal company manufactures 90% of the cymbals used in the world. The segment on the covered bridges in Vermont was also memorable, and led to an abiding interest in the subject for me. In fact, there really isn’t a dud in any of these outstanding pieces. Some of the earliest segments are intriguing on multiple levels. One piece that caught my eye in a most unintentional way is "Christmas Toys." In this one, Kuralt contrasts toys from the 1920s and '30s with contemporary ones. The intent is to show how much more imaginative and reflective of a quieter age the earlier ones were. But for me, looking at this 40-year-old piece of film, I was as enamored of every one of those toys. While a large portion of the material is dated, there is no denying the impact the stories have. There is the profile of Jerry, proprietor of Jerry's Deli in Chicago, who abuses his customers to no end in a hilarious way. Other that stand out include the last barber pole manufacturer in the U.S., the man who drives a 40-horse stagecoach, and one on the sod houses of Nebraska. There are such a wide range of items exhibited in this set that it would be pointless to try and discuss them all, we are talking about over 17 hours of material after all. But there is one that stands above all the others for me. It began during Ronald Reagan's trip to Moscow, which Kuralt was attending as a journalist. An older Russian man burst in to the press area wanting to speak to someone from the United States. He relayed an incredible story to Kuralt about his time spent in a German POW camp, next to the American prisoners. The Russians were treated much more harshly than the Americans, and were dying of starvation. A small group of US soldiers conspired to give them some of their rations, which this man credits for saving his life. Over 40 years later, he still remembered the soldier's names, and gave them to Kuralt. The resulting reunion was incredibly moving.Television like this simply does not exist anymore. As for bonus material, there is a lengthy (55 minute) interview with Kuralt’s cameraman, Isadore Bleckman. A piece titled About On The Road, updates on some of the stories, and a biography of Charles Kuralt. 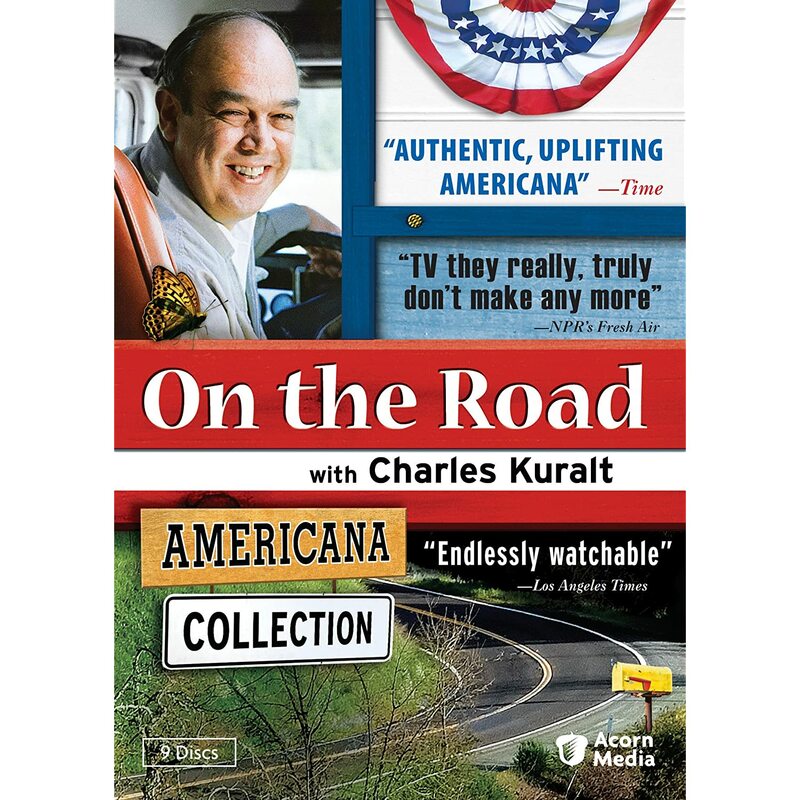 On The Road With Charles Kuralt is kind of like comfort food for your DVD player. While the nutritional value may be questionable, the satisfaction level is off the chart. This sounds really cool Greg and as you say it's a historical record already.